Dogs are commonly known as man’s best friend for a reason. They are people’s loyal buddy and they their master’s completely. The will forgive us anything and ye they ask for so little in return. As a reward for their faithfulness, most people only think to give their dogs tasty treats. But like people, dogs love to receive gifts too! Imagine how happy he is during Christmas morning. If your dog has birthday coming up or you’re thinking of doing your Christmas shopping early, the following gift ideas will help you make a decision on the best and ideal gift for your dog or dog lover in your life. You must shop online at a designer dog boutique for designer dog collars and leashes. You must find a collar that is distinctive and attractive. Like for example, you must think about shopping a dog collar and leash that is right for the holiday. There are many beautiful Christmas collars out there that make great gifts. Not only do special treats make great gift ideas, however they are also tasty and healthy. 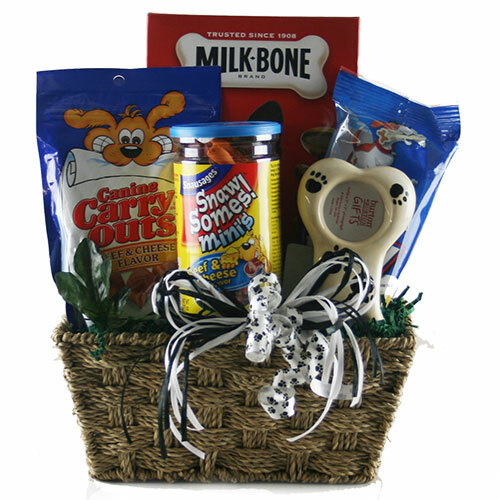 There are lots of online designer dog boutiques that offer gourmet dog treats that are already packaged beautifully in gift boxes or gift bags. Or, if you want you can buy the gourmet treats and pack them by yourself. Don’t buy too early as it may spoil. We all want our pet to look and smell so good. Shop around and you can find shampoo gift sets that are already packed as gifts. Or you can put together your own grooming gift basket. You can add items like dog brush, dog cologne or spritz, organic dog shampoo and conditioner. Pretty sure, your canine will really love this gift! Your tail-wagger deserves something that’s best. So, why not give them the perfect combination of comfort and class? Think of beautiful fabrics, utmost comfort as well as the quality. Designer dog beds are the way to go if you decide on a bed as a gift for your dog or doggy friends. Many of the online dog boutiques sell dog toys that are wrapped as a gift sets. You can also buy few toys and put them together in a cute gift bag. Better yet, wrap each one individually so your pooch has more gifts to open! No matter what you decide on for a dog gift, you must ensure that you make it look like a gift. If it doesn’t come pre-wrapped in a gift box or bag, assure that you devote time in packing in a nice paper or bag to make it a great gift. You can spend as much or as little as you like on your dog gift. The most important thing is to put some love and thought into the gift and to make it special or unique just like your fido!